If there’s a Chinese business person in your neighborhood talking about buying a local company or plot of land, you’re not alone. Excluding bond purchases, Chinese investment in the U.S. set a record last year at over $14 billion, rising more than 50 percent from 2012. Whether more is on the way is largely our choice. The American Enterprise Institute – Heritage Foundation China Global Investment Tracker is the world’s only fully public database on Chinese non-bond investment. It contains more than 500 outward investments of $100 million or more made by the People’s Republic since 2005, worth over $475 billion (plus hundreds of engineering and construction contracts). The American performance in 2013 pushed it past Australia as the PRC’s leading target. Since 2005, the U.S. has received about $60 billion in Chinese non-bond investment. While Chinese purchases of U.S. Treasury bonds are much more extensive, they are also abstract. The PRC doesn’t just buy slips of American paper anymore. In 2013 alone, it bought a large food company (Smithfield), extensive and recognizable properties in Los Angeles and New York, and several billion dollars in shale production rights. Is this a good thing? It certainly is for Americans selling some of their land or parts of their companies. To block people selling what they own – to interfere in free enterprise – there better be a good reason. A knee-jerk reaction is “China is taking over.” You might remember that in the 1980’s, Japan was “taking over.” It wasn’t a real threat then, and it isn’t now. Total U.S. wealth – the monetary value of all the things we have – exceeds $75 trillion. Chinese investment is a drop in the bucket. A more substantial argument is the PRC is not an ally and frequently not a friend. Because it’s not an ally, some Chinese deals should be scrutinized closely by the Committee on Foreign Investment in the United States (CFIUS). These are deals that could pose a risk to American security. When there isn’t a genuine risk, CFIUS should quickly get out of the way. Because China is frequently not a friend, we don’t owe them anything. The American market should be open and transparent because it benefits Americans. If Beijing has complaints, these should be given the same weight accorded to American complaints about Chinese policies. For example, the U.S. rightly views Chinese state-owned enterprises (SOE)’s as heavily subsidized while the PRC believes the U.S. discriminates against them. Beijing is half-right: outside the U.S., SOE’s account for close to 95 percent of Chinese investment by value. In the U.S., they account for less than 70 percent. But until American firms are treated better in China, there is little reason for the U.S. to welcome Chinese SOE’s. Looking ahead, the AEI-Heritage tracker demonstrates a clear pattern over time: Chinese firms have a herd mentality, and they get restless. They invest heavily in a region, say South America, for two years or so and then largely move on. The U.S. could break this rule. We have everything China doesn’t have at home – resources, technology, and protection of property rights. 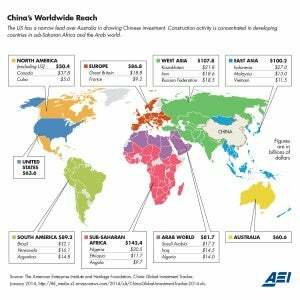 And our market is large enough to absorb far more Chinese investment than any other country. With a critical exception for national security, we should be open to this possibility. Record Chinese investment in the U.S. in 2013 was good for both countries. Derek Scissors is a Resident Scholar at the American Enterprise Institute.